Bar Graph vs Histogram - Difference Between Bar Graph and Histogram! This is a question that is often asked. What is the difference between bar graph and histogram and when one should use a bar graph versus histogram? Both the column chart (or bar chart) and histogram are graphical representations of data. But there are differences between them. Column charts or bar charts are used to compare values across different categories. Column charts are most often used to emphasize changes over time or for comparison of items or categories. A histogram, on the other hand, is a type of chart that evaluates frequency data. 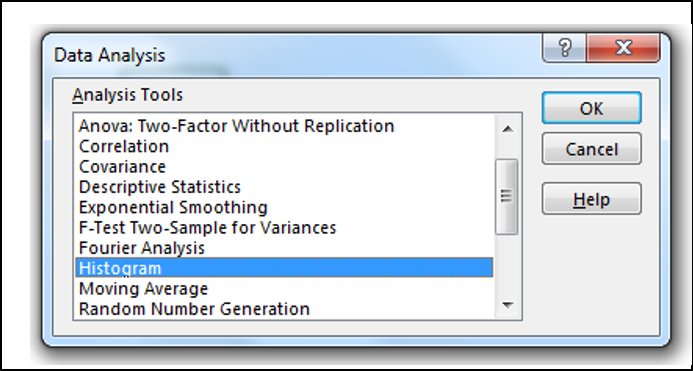 A histogram looks at data points and intervals and counts how many times data points fall between specific intervals. In the following image, I have shown you to charts side by side. Just take a closer look at the charts and you will feel the differences easily. So when does one use a histogram and when does one use a column chart – well it all depends on the data analysis that is required. If one wants to see a specific category/item in comparison to another set of categories/items, one is more than likely, needing to use a column chart. If one is looking at the number of times data points fall within a certain range then use a histogram. 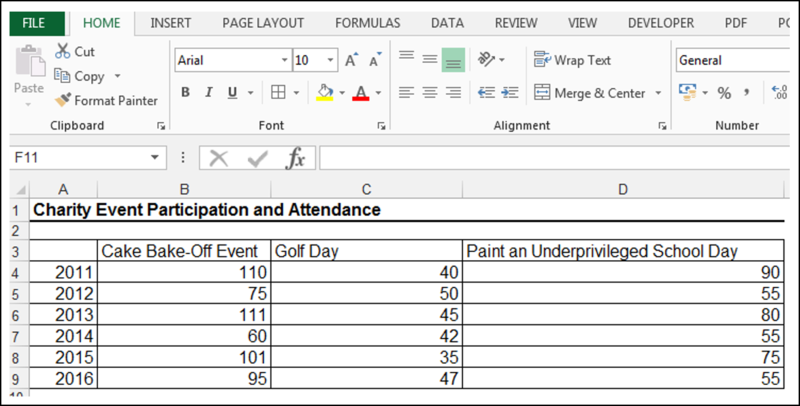 What do I mean by the above, well, let’s look at how to create a column chart versus a histogram and the way data is set up for each type of analysis. 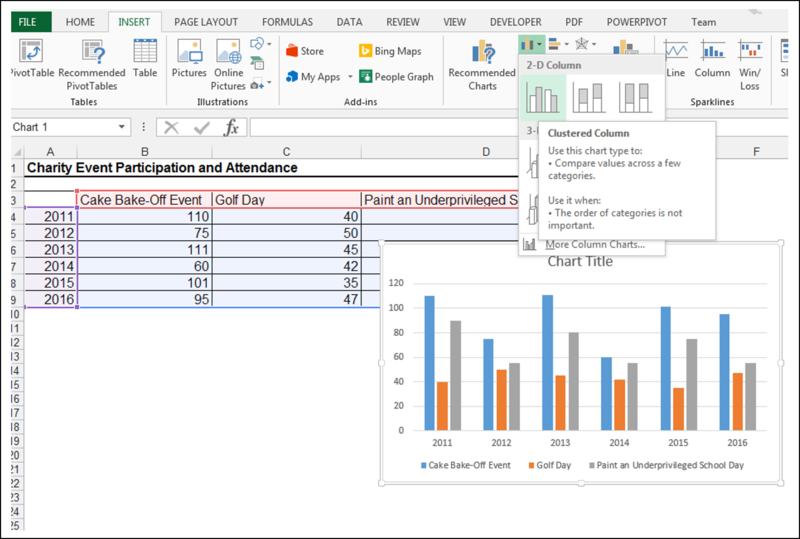 Before performing the bar graph and histogram in excel we need to know the difference between bar graph and histogram thoroughly. The below table shows the detail difference between bar graph and histogram. 7) Re-arrange of blocks are common 7) It’s not possible to re-arrange the data once it is done. An administrator working at a hypothetical charity organization wants to compare the attendance (evaluate participation in other words) at the three major charity events, the charity organizes each year. The charity has a community Cake Bake-Off competition event, a golf day and a Paint an underprivileged school in the area event. These three events have happened each year for the last few years. The administrator has decided to use a column chart, in order to compare attendance at the three events over the last few years. The source data for our column chart example is shown below. 1) As you can see, we have our three different categories/items namely the Cake Bake-off event, the Golf day and the Paint an Underprivileged School day event. 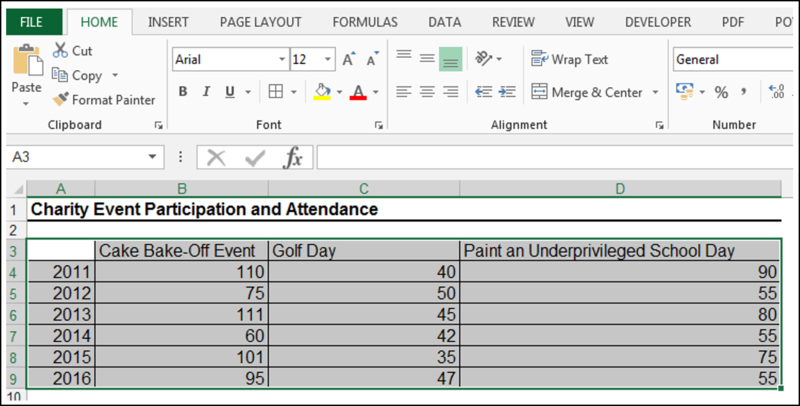 The attendance/participation of each of these different categories will be represented by the vertical bars on the column chart. 2) In order to create a column chart from this data, select the entire range as shown. 3) Go to Insert>Charts>Insert Column Chart and choose 2-D Clustered Column Chart as shown below. 4) One can then format the chart accordingly, by removing gridlines and choosing a chart style in order to get the following column chart shown below. 5) This column chart provides an easy way to graphically see, the most popular event in terms of attendance and participation and that was the Cake Bake-Off competition. Comparatively, in terms of attendance, the Cake Bake-Off event was more popular than the other two major events organized, by the charity annually over the years. 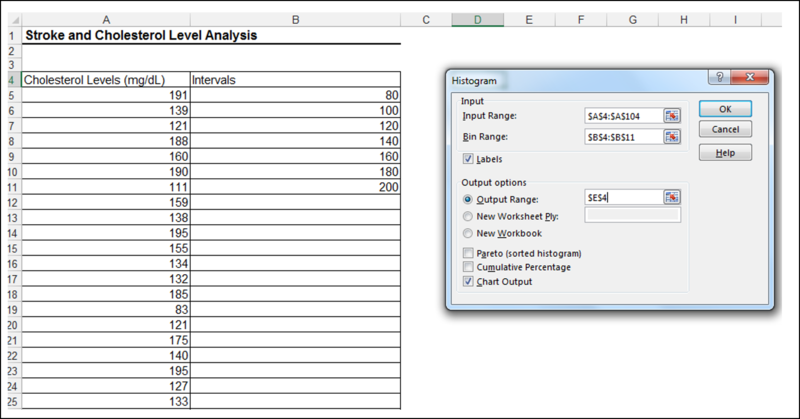 For our histogram example, a medical biochemist is given key monthly medical data from a hypothetical hospital. There were 100 patients, who had a stroke for the month of September and their cholesterol levels have been noted. This biochemist is interested in recording the cholesterol level of the stroke patients and grouping these points into each cholesterol range or interval. The source data for our histogram example is shown below. 1) As you can see, the way this data is set up is very different from the column chart example. 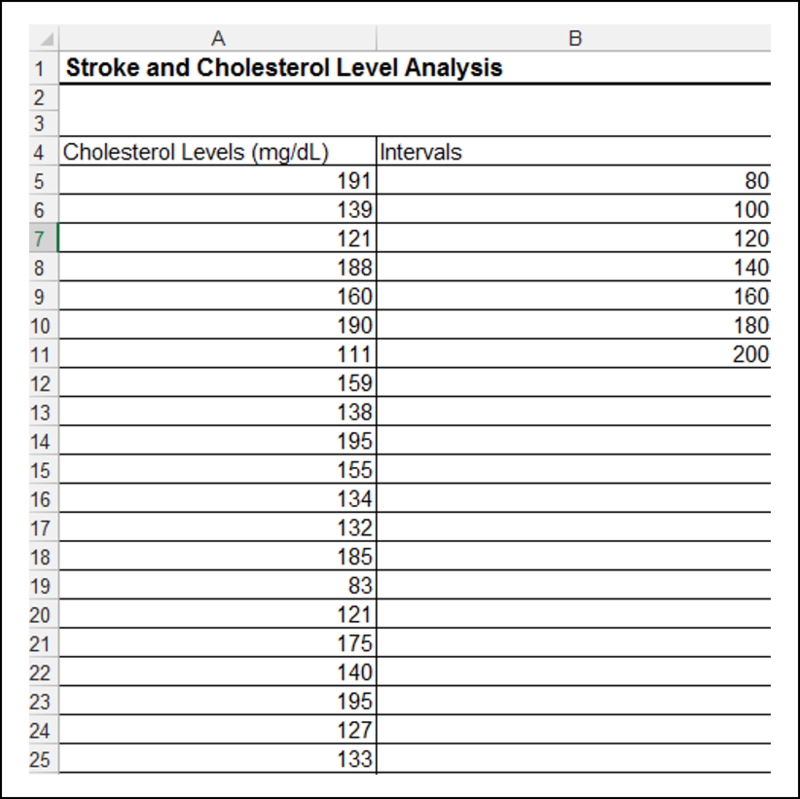 We have our input data in the first column, these are the actual cholesterol levels of patients that had a stroke, that was recorded. In the second column, we are denoting our intervals or bin ranges. These intervals set are consecutive and non-overlapping. Our histogram will tell us how many of our recorded patient cholesterol values, fall within those set ranges. 2) First things first, make sure the Analysis ToolPak is enabled. 3) Go to Data>Analysis>Data Analysis as shown below. 5) Our input range, in this case, is the recorded cholesterol levels of the 100 stroke patients, which is the range $A$4: $A$104. Our bin range is the range $B$4: $B$11. We tick Labels since we have included the labels. Under Output options, we select $E$4, on the same worksheet as the output range to make sure our chart is on the same worksheet. We check Chart output as shown below. 6) Click Ok in order to obtain the histogram shown below. 7) We can format the histogram by adding a title, adding a gradient to the chart area and by formatting the horizontal axis to get the following chart output shown below. 8) We can conclude that of the 100 patients who had a stroke, most had cholesterol levels between 161 mg/dL-180 mg/dL since that is the range/interval where most of the data points were recorded. There are several key differences between histograms and column charts. Histograms provide quantitative analysis and the data points are grouped into set intervals, while column charts are used to make comparisons across categories. The way the data is set up will also give a clue as to which option one should use, histograms have the data points in one column and the bin ranges or intervals in the column next to the data points column. Column charts will not have interval ranges in the source data. In the examples above, our charity organization was comparing the attendance for the three different events organized by the charity, hence the reason a column chart was used. In the hospital example, all of the patients had had a stroke and the biochemist was interested in grouping the data or the cholesterol levels into set ranges in order to see the frequencies. Please feel free to comment, and tell us your thoughts about histograms and column charts.